Get in quick, get out quicker. These are the words Keralie Corrington lives by as the preeminent dipper in the Concord, the central area uniting the four quadrants of Quadara. She steals under the guidance of her mentor Mackiel, who runs a black market selling their bounty to buyers desperate for what they can’t get in their own quarter. For in the nation of Quadara, each quarter is strictly divided from the other. Four queens rule together, one from each region: Toria: the intellectual quarter that values education and ambition Ludia: the pleasure quarter that values celebration, passion, and entertainment Archia: the agricultural quarter that values simplicity and nature Eonia: the futurist quarter that values technology, stoicism and harmonious community When Keralie intercepts a comm disk coming from the House of Concord, what seems like a standard job goes horribly wrong. Upon watching the comm disks, Keralie sees all four queens murdered in four brutal ways. Hoping that discovering the intended recipient will reveal the culprit – information that is bound to be valuable bartering material with the palace – Keralie teams up with Varin Bollt, the Eonist messenger she stole from, to complete Varin’s original job and see where it takes them. It was basically The Hunger Games at BookCon to get this book, it was a little brutal but it was all well worth it in the end. Us and a bunch of blogger friends banded together to make sure we all were able to get a copy. It was a lot of fun, and a lot of bonding time. I read Four Dead Queens on a car trip, and from the first page until the last my attention was captured. To say that I am obsessed with the world Astrid created is probably the understatement if the year. It gave me more of a science fiction vibe rather then fantasy. To me it reminded me of the faction system in the Divergent series, which is a cool concept with in itself. The whole four queens aspect is awesome. Each queen has a chapter or two dedicated her and it easy to tell from the beginning their distinct voices. In their chapters we see their backstories and the history of the secrets and the country they are trying to protect. The whole who murdered the queens and who was onto the murder plot and who they planned on accusing and how it all panned out really took me for a loop. Where I thought I understood one thing it ended up being the total opposite and kept me guessing until we finally learned everything about these murders. 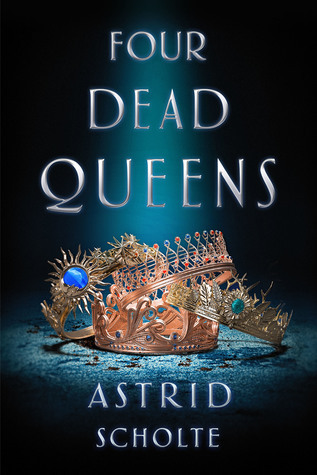 I got a lot of love for Four Dead Queens and I can't wait for it to be out in the world for everyone to read. It has something in it to appeal to readers of every kind. 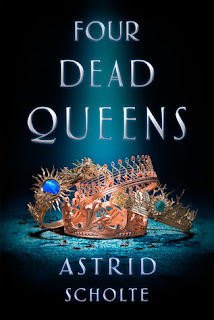 I am looking forward to anything Astrid publishes next!